Strapped into a small holding device, the honeybee amiably wiggles its antennae. Like a toddler in a highchair, it seems to reach greedily for the dropper with sugar water that appears over its head. As its mouth opens, its tongue darts out for a taste of the sweet liquid. Editor’s note: Amy Schneider is a senior in zoology. She plans to attend graduate school in journalism. This isn’t just a strange way to treat a honeybee to lunch. It’s all part of Ramesh Sagili’s effort to understand honeybee behavior, and in particular, the reason for their sudden disappearance. Since the emergence of Colony Collapse Disorder in 2006, entire hives of honeybees have been dying with no obvious explanation. Honeybee decline could seriously damage agricultural crops across the nation. Take the $2 billion California almond industry, which depends heavily on domestic honeybees to pollinate almond crops. Every February, 1.5 million honeybee hives are trucked from all over the country to pollinate the thousands of acres of almonds. According to the U.S. Department of Agriculture, honeybees pollinate 90 percent of the country’s apple and blueberry crops and are partially responsible for pollinating oranges and peaches. In fact, honeybees play a part in pollinating at least 130 U.S. crops. Since about one-third of our food depends on bees for pollination, a decline in honeybee hives would be disastrous. And yet, that’s exactly what is happening. In late 2006, honeybees began to vanish from their hives at unprecedented and inexplicable rates. Beekeepers around the country were mystified when they opened their bee boxes, finding all the adult bees missing and only the queen and larvae remaining. Even stranger was that the absent bees were nowhere to be found, dead or alive. They were simply gone. Researchers were hard-pressed to explain this phenomenon. Colony numbers were dropping 30 to 60 percent in some areas of the country, and the future of a $20 billion industry was at stake. That was four years ago, and scientists are still searching for a solution to the mystery. When Colony Collapse Disorder (CCD) first gained attention, Sagili was working at Texas A&M University. 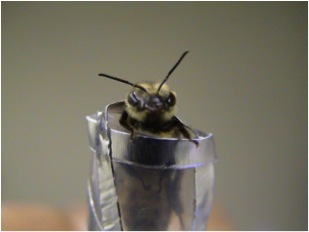 At the time, researchers were not focusing on honeybee sustainability. “Because we weren’t seeing big losses, we were trying to increase colony productivity for the farmers,” Sagili says. As CCD hit, Sagili realized that he needed to shift gears and focus on honeybee health. Oregon State University hired him in 2009 to work with Oregon beekeepers and to study colony health and vitality. “I had to change direction completely,” Sagili adds, referring to his new studies that revolve primarily around diagnosing what is wrong with the bees. At OSU, Sagili is the Sherlock Holmes of honeybees. He searches for clues in the insects themselves, collecting honeybees from around the state. He keeps in touch with about 25 of the state’s commercial beekeepers through email or conferences. Twice a year, he and his colleagues at the OSU Honey Bee Lab examine the collected bees for levels of mite infestation, fungal spores and protein content in food-producing glands. Modern agriculture may put stresses on honeybees that they don’t face in nature. For example, almond trees in California are practically the only plants blooming in February when bees are trucked in for pollination. Consequently, the bees acquire little but almond pollen for an entire month. 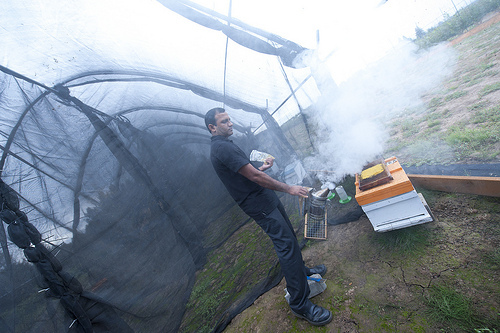 Ramesh Sagili, Oregon State University entomologist, is investigating bee nutrition (Photo: Lynn Ketchum). That’s a problem, says Sagili, because just like humans, bees require a balanced diet. Some amino acids, the building blocks of protein, must come from food; neither people nor bees synthesize all the ones they need. Bees need 10 amino acids in their diet for full development, and since their only protein source is pollen, collecting a variety of pollens is crucial to proper nutrition. Bees eating only almond pollen are like people living only on French fries. A diet composed of single source pollen does not provide enough nutrients, and, suggests Sagili, may weaken the bees’ immune system. Poor immune systems leave honeybees greatly susceptible to parasites and disease. While these threats are nothing new, unhealthy and nutritionally deficient bees could be falling prey to old pests as their defenses are being drained. That’s why Sagili is interested in finding a connection between bee protein and immune systems. Poor nutrition might help to explain why bees are disappearing. The other pressures on bees — parasites, viruses and pesticides — are potential contributing factors, and CCD may be the ultimate result of all of them. Sagili is performing experiments to narrow down the possibilities. In one, he places bees in a “containment tube” and offers them different concentrations of a sugar solution. This taste test, with the bees waiting patiently and wriggling their antennae in anticipation, allows Sagili to learn more about their ability to detect sugar concentrations. Because worker bees have specialized jobs in the hive, some can detect higher concentrations better than others. It’s possible that nutritional stress may affect important foraging behavior of honeybees. “Once we gather some good information from the past two years, we can see if there’s a correlation between survival status of the hive and all the problems that we found in the hives, such as protein content,” Sagili says. Meanwhile, as Sagili and other scientists learn more about honeybees and their behavior, the number of hives continues to dwindle, from about 5 million in 1950 to 2.4 million in 2010. If Sagili is right and nutrition is the most significant problem, then beekeepers, farmers and orchard managers may be able to reverse that trend by ensuring that their pollinators are well fed. This is so worrying. People don’t realise how vital honey bees are. At least there are people looking into this. Keep up the good work.